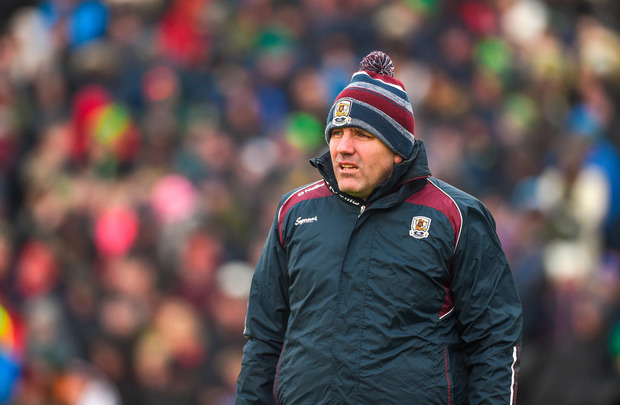 Tomás Ó Sé thinks that Galway can improve but will rejoice in their underdog status as they seek a place in this year’s All-Ireland Super 8 series. The Kerry legend said that while the Tribesmen are a 'work in progress', they are a team on the rise. Speaking on The Throw-In, Independent.ie's GAA podcast, Ó Sé said that the Galway manger Kevin Walsh is in a perfect situation. "Kevin Walsh will be delighted," he said. "He’ll be happy with two things. With the win obviously, three in a row against Mayo, a great Mayo dominant side, so Galway are definitely on the upward curve. "But he’ll also be happy with the fact that he can go back to training and say 'lads we did a lot good things and we and won the game but…' and there are a lot of buts." One of the areas that Ó Sé thinks Walsh will look to improve is Damien Comer’s vision on the field. While the full-forward has proven himself to be almost unmarkable, the former defender said that he could be polished into one of the best footballers in the country. "Comer has the potential, I think it’s absolutely frightening," he said. "He is fearless. He’s like the animal who will go for this gap and no matter how hard you beat him back with the stick he’s stubborn, he’ll keep going, he’ll keep driving at you. "But his awareness (if improved) could create goals every game. He can draw attention. Two or three will come in on him and he will have runners off him. He needs to be more aware of what’s happening around him." Galway's defensive style of football has garnered scepticism but Ó Sé said that this is exactly what Walsh would want for his team. "There are still question marks about Galway, but Christ, what a position to go in," he said. "People will still question them after the Mayo game and that's brilliant in terms of getting your mind right, challenging your players to go to the next level. It’s all set for Kevin Walsh." Having been promoted from Division 2 of the National Football League last year, many expected Galway to struggle in the premier division but they challenged Dublin for the title. Ó Sé said that making the All-Ireland series this year would be enormous for their continued development. "I think making the Super 8s this year would be huge progress for them because they're there," he said. "The have three games now and then they can decide where they're at." "They will be put to the test between here and the super 8s but I think they're going in the right direction."